How many of you have attended a professional networking event? Most of us have been to more than a few such shindigs where we’ve collected and exchanged a few business cards, munched on a few crudités, and smiled while pretending to be on a Very Important Call on our cell phone. Still, we go because we need to Make an Appearance, or because our boss expects us to get out of our office from time to time, or because our competition is going to be there, or because we need to drum up new sponsors for our next special event. All valid reasons for showing up. Sometimes we make a connection that’s worth the registration cost and sometimes we feel like all we did was spend the evening stumbling over our elevator speeches. For many non-profit organizations, these events can be costly and time consuming. That’s where blogging and guest blogging have become the new professional networking events and ones with much potential for non-profit communicators. So, how can you make blogging and guest blogging work better for you? If you don’t have one, create a blog on your website, or by using WordPress or Blogger. Generate a list of “evergreen” topics that can be used for posts. Do you have an FAQ section on your website? Start there by using several of those questions or issues as topics to write about. Use Evernote as place for capturing ideas (I currently have about a dozen possible blog post ideas for this column in my Evernote app on my phone). Many individuals have a presence on LinkedIn – but does your organization? If not, make sure it does. For guest blogging, seek out opportunities with your local media organizations (the newspaper, your local Patch.com site) to write a guest post on an issue. The large metro papers might be harder to pitch initially (maybe a board member has a connection?) but the smaller weeklies and online publications often welcome contributors. Share buttons are your best friend. Once you’ve written a post, remember to share it everywhere: on your website, your Facebook page, on Twitter (several times!) and LinkedIn. Encourage your supporters and board members to share it as well. Look at your corporate donors’ websites: many of them highlight the charitable activities they support in the community and would welcome the chance to feature yours. It’s tempting to want to try everything immediately or to mimic what the larger organization down the street is doing. Start with what works for your organization and your capabilities. Figure out what a comfortable ROI (return on investment) is. What does it cost in terms of time to craft a blog post and promote it on various channels? Could other staff members be tapped to help (they may be delighted to be asked!) or a volunteer, or is it more cost-effective to hire a “ghost blogger” on a consultancy basis? I’m honored to join the Benchmark team as a guest blogger. Starting with this column, each month I’ll be writing on topics that I hope will be of interest to non-profit professionals. Since 1991, I’ve worked in fundraising and communications with small grassroots non-profits as well as national, chapter-based organizations. My area of expertise is in individual and corporate giving, grant writing, development writing, social media and content management. I’m excited about this new opportunity and connecting with you. 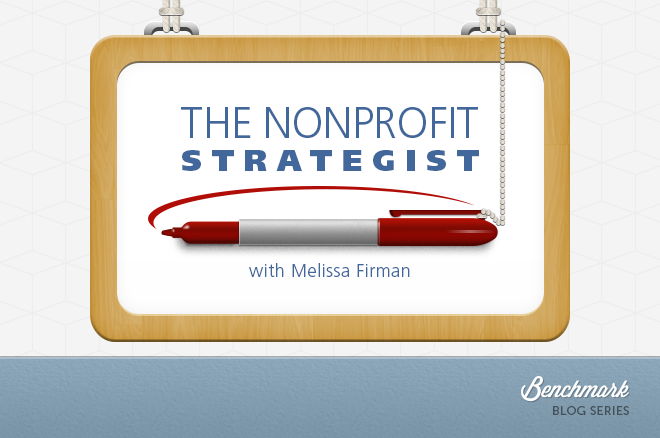 Do you have a suggestion for a future The Nonprofit Strategist column or feedback on this one? Send me your thoughts at thefirmangroup@gmail.com.